As I curate the MUG Forum and curate Matterport 3rd party solutions, I am trying to be sensitive to the needs of MUG Forum Members that own a Matterport Camera and Visitors that either own or are thinking about buying a Matterport Camera. So, I write about – and encourage others to write about – Matterport competitors. But, is that a good idea? The major of Matterport User Group Forum Members and Visitors want to read in the MUG Forum about competitive platforms to Matterport. 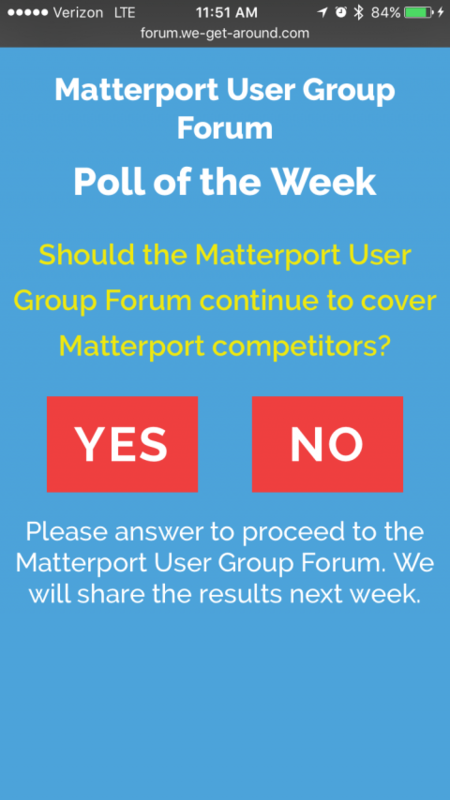 69.2 percent of MUG Members - and 50.2 percent of MUG Visitors responded YES to the MUG Forum Question of the Week during a 24 hour poll starting on 16 August 2016, "Should the Matterport User Group Forum continue to cover Matterport competitors?" As a Matterport Pro, I want to know if other platforms are a threat or an opportunity for me. What are your thoughts about comparing other 3D/VR platforms to Matterport in the MUG Forum? BTW, if you experienced a recent "take-over" poll, thank you for participating in our experiment with these one question polls to help give the community insight. ✓ Why Other Cameras, Platforms and Related Tech? ✓ MUG Forum Poll: Is your company planning to buy a Matterport Camera within the next 90 days? Special thanks to @MikeW at NinjaPost for its Popover Genius service that enables us to easily, quickly and affordably implement these "take-over" polls. Dan, I view these forums on mobile devices that do not stay logged in and if I am just viewing a post, I don't log in. I usually go from the url in email. The polls get in the way and slow down viewing. Some days I tap yes and some days no. Thanks in advance for tolerating a now and then poll that helps give us quick insight into the community to help make the MUG Forum as responsive to the desires of the community as possible. ALWAYS good to know what the competition is doing...ALWAYS. I think it is worthwhile to be on top of it all, for if a client were to ask why do you chose matterport over this one or that one we will be able to answer with confidence why we chose matterport and we could even give them a reason why. On another note, if someone I am trying to sell my service to thinks that it's too expensive and therefore does not want my service (using matterport camera), I can always offer them a cheaper less immersive experience with one of the other competitors. So the answer is yes on two accounts. I think 20 of the YES votes were mine because it did force the survey on me each time I went to view a post. I didn't mind so much because it was a quick click to get past, but I worried about how I was skewing the results. I started thinking I should maybe vote no to even up my answers to not affect the results so much, but decided not to. Thought I'd mention that for the next survey.